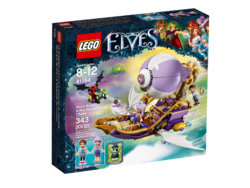 41184 Aira's Airship & the Amulet Chase is an Elves set released in 2017. Chase after the stolen amulet and search for Sophie Jones! Join the exciting new adventures in Elvendale as Emily Jones and Aira Windwhistler the wind elf search for Emily’s stolen amulet and her sister, Sophie Jones. Fly in Aira’s airship, with spinning propeller, space for two mini-doll figures, extending wings and a crossbow, and avoid Dukelin the Goblin on the goblin glider with movable wings, evil seed shooters and opening hatch with small storage space. Includes two mini-doll figures plus a goblin. Includes two mini-doll figures: Emily Jones and Aira the wind elf, plus Dukelin the Goblin. Features Aira’s Airship, with balloon and spinning propeller, extending wings, room for two mini-doll figures and a storage space in the airship with an opening hatch. Also includes a goblin glider with opening hatch and small storage space, movable wings and evil seed shooters. Help Emily Jones and Aira build the airship with her magical blueprint book. Shoot evil seeds at the airship with Dukelin’s goblin glider. Extend the ship’s wings for fast flight mode. Stash Emily Jones’ amulet in the back of the goblin glider and fly away. Accessory elements include a magical boomerang, Aira’s blueprint book, map, compass, evil seeds, stud elements, amulet, crossbow and two berries. Airship measures over 6” (16cm) high, 9” (24cm) long and 9” (24cm) wide. Goblin glider measures over 1” (5cm) high, 1” (4cm) long and 3” (8cm) wide. Facts about "41184 Aira's Airship & the Amulet Chase"